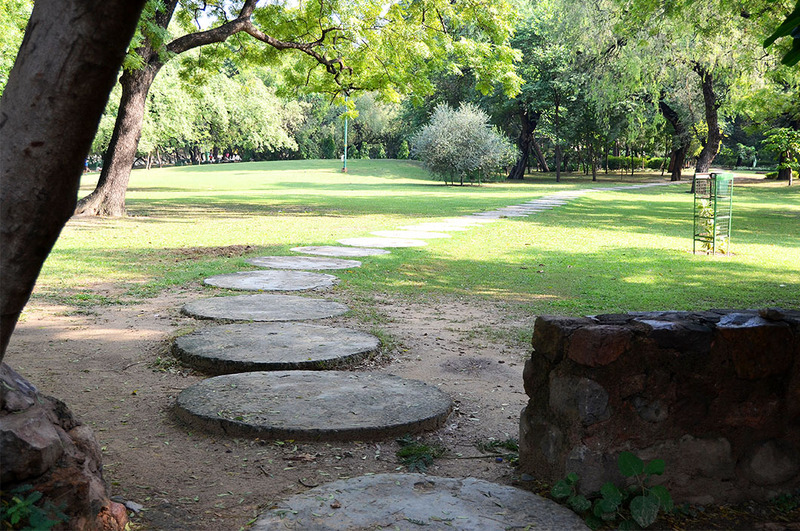 If there is one thing I envy Delhi-ites, it is the green oasis of Lodhi Gardens. Over ninety acres of unexpected tranquility to escape the gridlocked delirium of their capital city. The landscaping would be easy enough to replicate elsewhere in India (who am I kidding!). But it is the historic ambience, those omnipresent vestiges of Delhi’s storied past, that make this space even more special. The oppressive September heat seems to drop a palpable couple of degrees as we enter gate 1, from Lodi road. A royal palm lined path leads to a mound topped by one of few surviving structures from the 37 year reign (1434 – 1451) of the Sayyid dynasty, the second to last of the Delhi Sultanate. 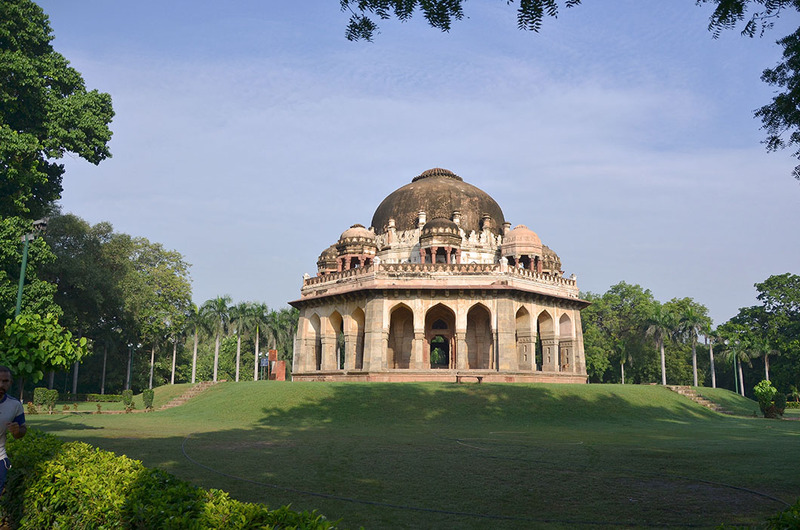 The octagonal tomb – a shape generally reserved for rulers – with Indo-Islamic architectural elements including the umbrella like chhatris and the inverted lotus on the dome, houses the remains of Muhammad Shah Sayyid and members of his family. 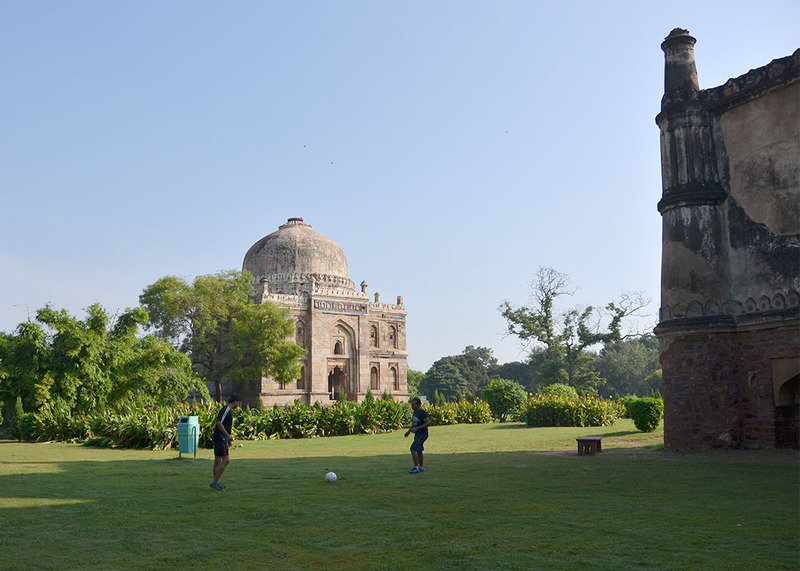 We traverse the timeline to some of the distinctive monuments of the next dynasty: the one that gives these gardens its (post independence) name. 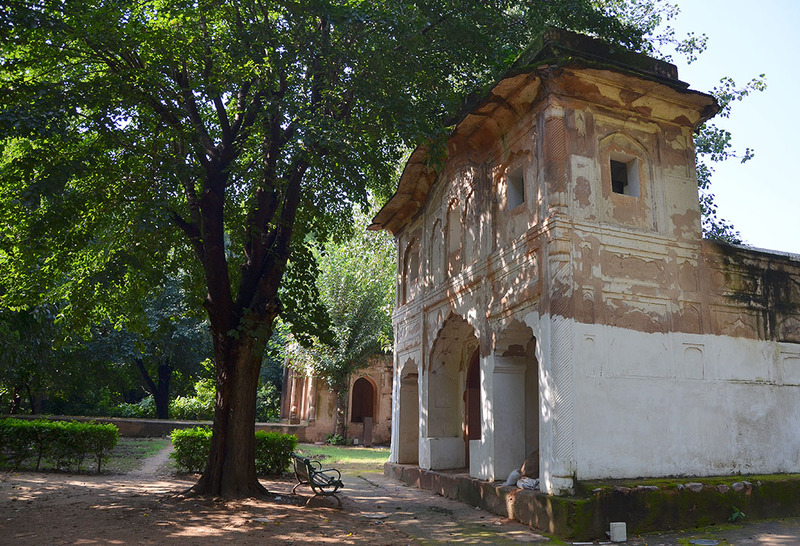 Earlier – following the 1936 transformation of what was once Khairpur village into this heritage landscaped garden – it was named Lady Willingdon Park, after the wife of the then British viceroy. 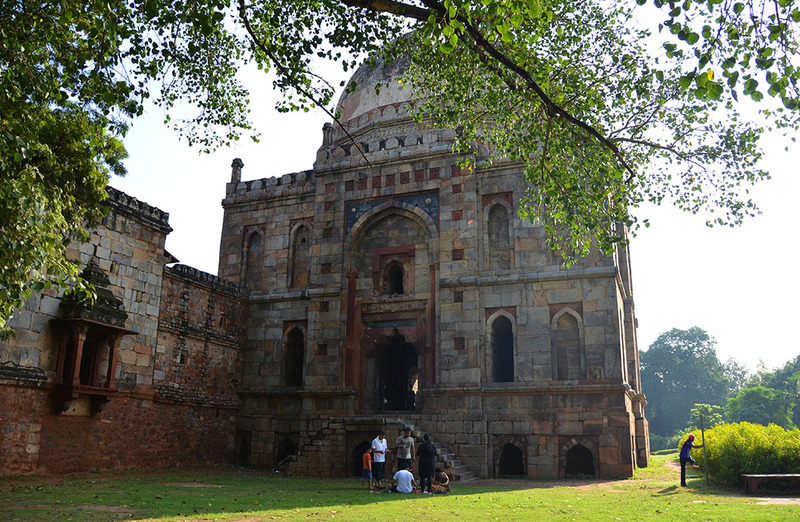 The angular, (mock) double storeyed architectural style of the Bada Gumbad complex is characteristic of the Lodhi period. The ‘tomb with the big dome’ as the name suggests, might very well have been the gateway to a mosque, since no graves or human remains were found inside. A beautifully decorated mosque – the Jama Masjid – and a domeless arched pavilion – the Mehman Khana (guest house) – flank the Bada Gumbad. 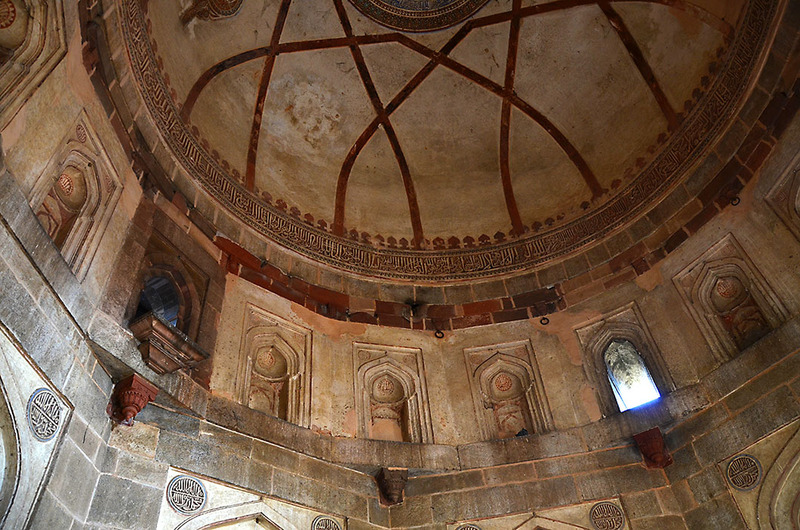 Opposite, is the Sheesh Gumbad (Glass Dome) whose dome and facade were once clad with reflective glazed tiles. 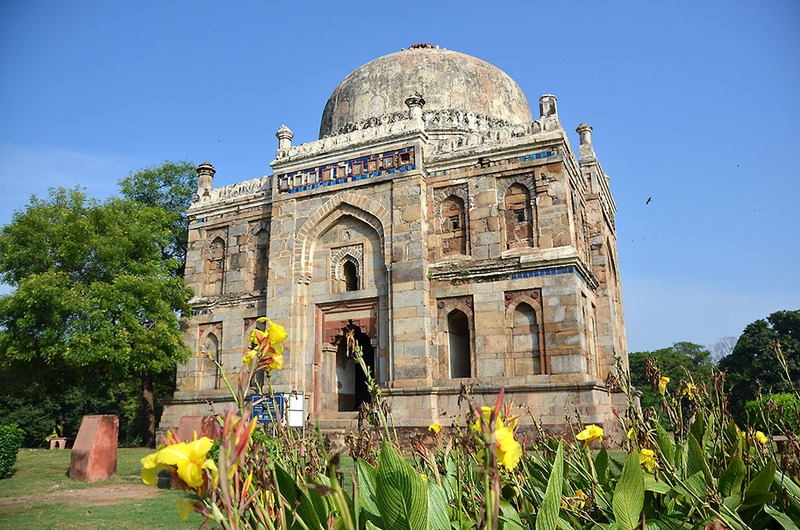 It is believed to be the tomb of the first Lodhi emperor, Bahlol, although I do not spot any distinguishing features among the half a dozen or so graves inside. The plaster detailing on the facade is eroded, but bands of square turquoise and cobalt blue tiles beneath the external cornices still glisten in the morning light. If tombs are not your thing, this part of the garden offers plenty of opportunities for people watching. We stop to watch a mini football game in one corner. A breakfast picnic is laid out on another. Joggers, yoga enthusiasts and young lovers add colour to the late summer setting stripped of winter blooms. 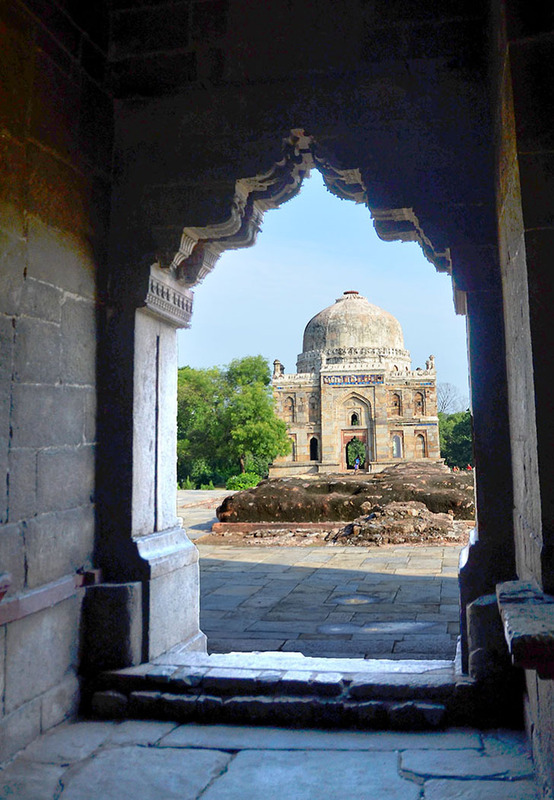 Up ahead is the final resting place of – Sikander Lodhi: the second and greatest of the (Afghan) Lodhi Sultans. 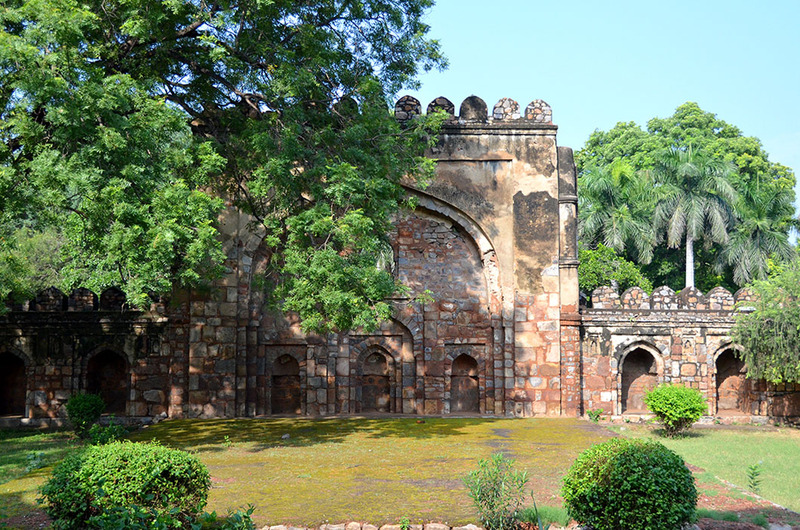 It was built by his son Ibrahim Lodhi in 1517 and appears to have been loosely styled after the older Muhammad Shah Sayyid tomb, sans the chhatris and set within a walled garden and accessed from a fairly elaborate gate. 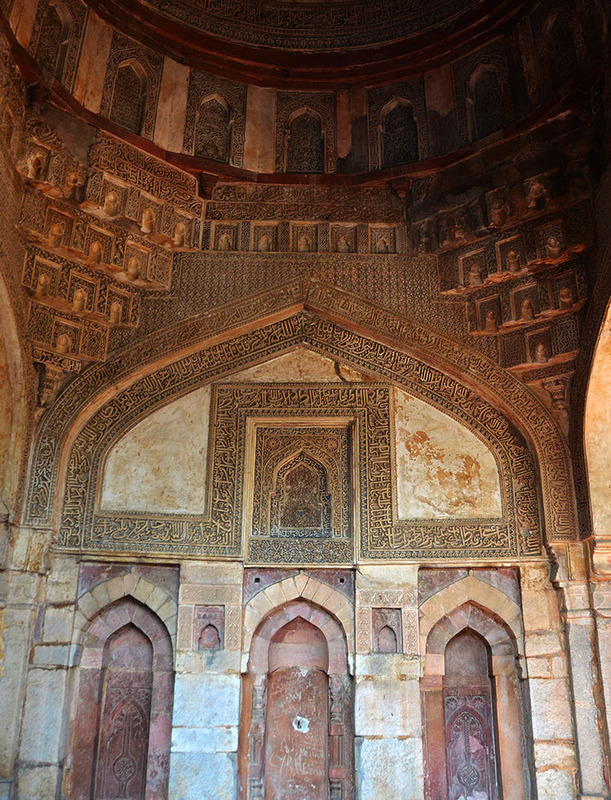 Part of the enclosure wall has a Mihrab (prayer niche facing Mecca) worked into it, so it functions as a wall mosque. Inside, is a simple rectangular grave devoid of any ornamentation. 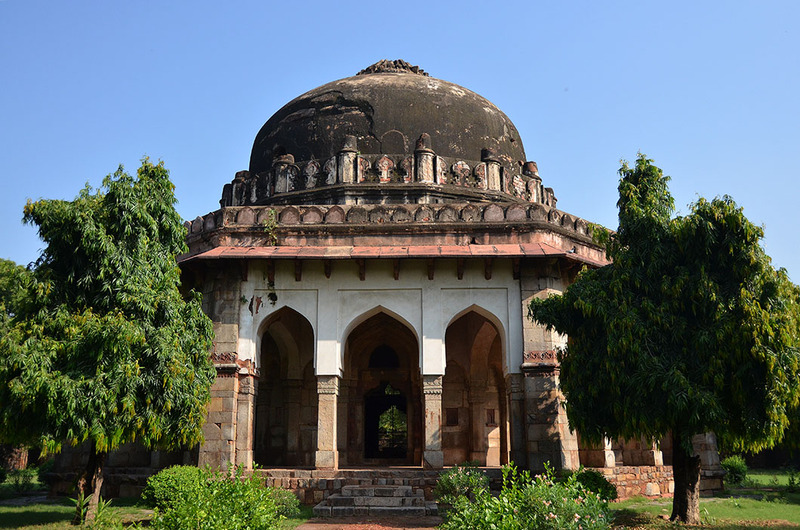 Sikandar was the last of the Delhi Sultans to be interred in Delhi. His son lies in Panipat, where he fell to the first Mughal: Babur. My envy multiplies at the sight of a large man made reservoir nearby, and the Mughal era bridge: the Athpula (eight pier). 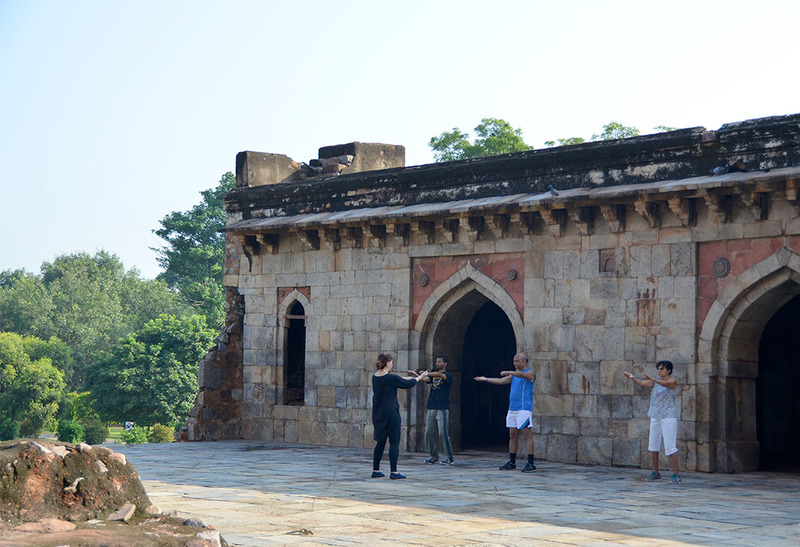 The 16th century bridge possibly spanned a tributary of the river Yamuna that once flowed through here. The dreamy, verdant setting complete with frolicking geese is certainly not what I expect to find in the heart of this smoggy city. A lesser mosque and an old gateway. A turret of unknown origin. 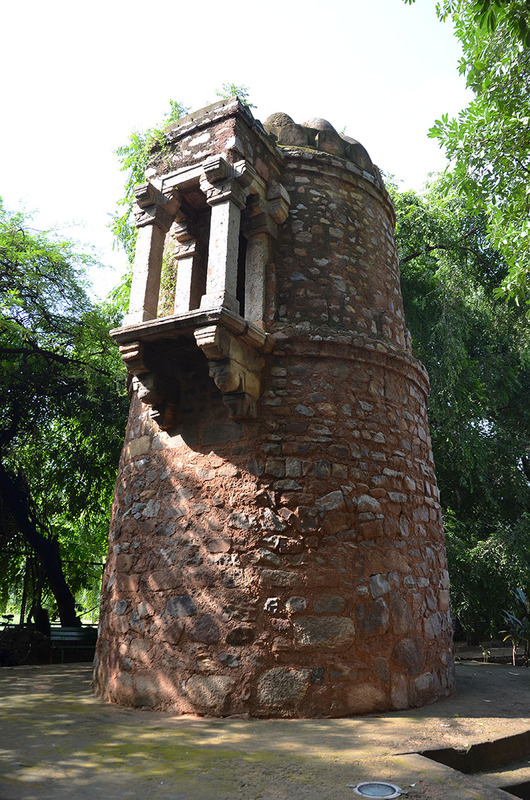 On our way out, we pass a small arched gateway, a lesser but beautiful mosque and a strange circular turret with an ornate window believed to be the oldest structure in the gardens, whose origins and history have been lost to time. Then, as if ejecting from a teleportation machine, we exit Gate 3 on Max Mueller Marg, into the frenzied bustle of modern Delhi. Thank you, Madhu, for this magical ‘storybook’ wander. What a beautiful and resonant place. Thank you for reading Tish. 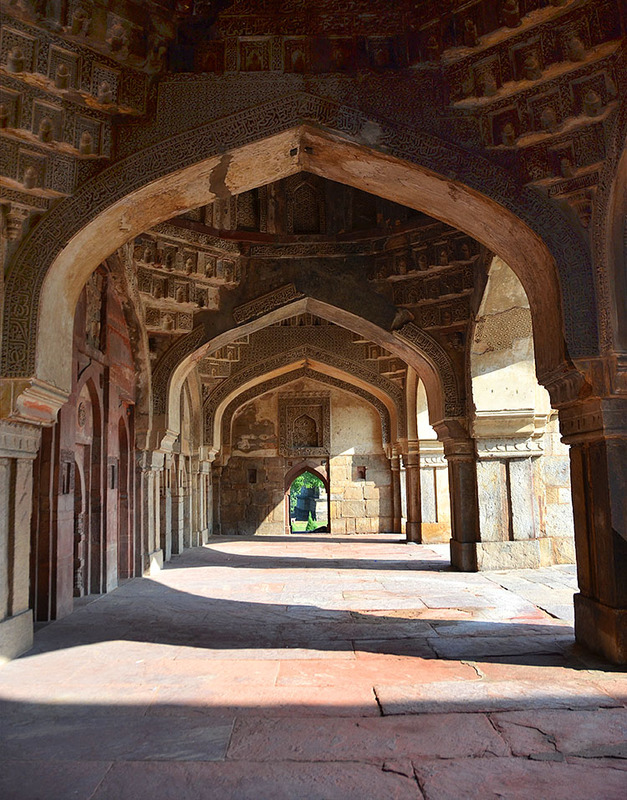 I just discovered a whole series of images in my Delhi archives, that I had forgotten about! Well cheers to your lucky discovery. Perhaps more Delhi photos coming our way? Ha ha, which ones were they? I often find myself wishing I could truly teleport myself to a more gracious age. Appreciate your stopping by Ashu. Many thanks. What a great post, Madhu…looks a wonderful place for a wander, thanks for giving me the virtual tour! And most unexpected in the heart of Delhi Malle. What a spot for a picnic, Madhu! 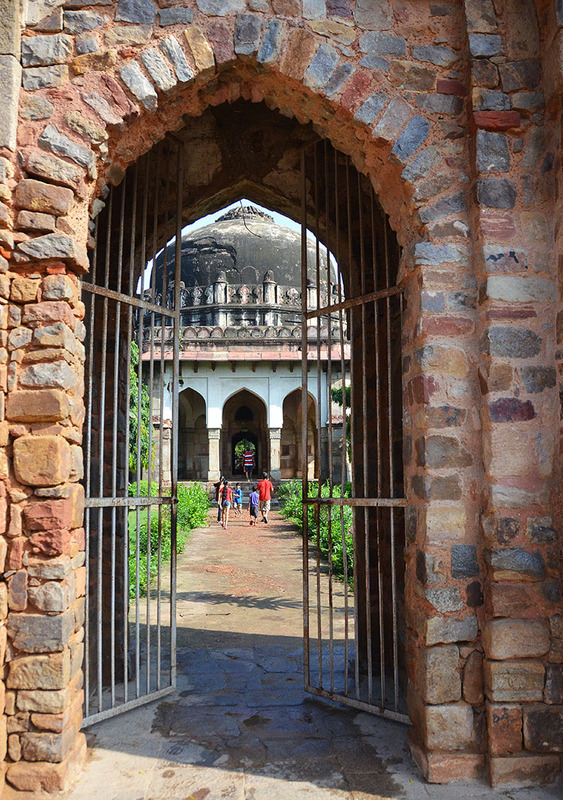 🙂 My favourite shot is of Sheesh Gumbad framed in the doorway- superb! 🙂 Thanks so much for sharing. I have meant to come and seek you out but it doesn’t always work that way, does it? Sending hugs! I would have had ‘working’ picnics if I lived in Delhi Jo! You were missed, hon. I assumed, as people do I suppose, that you were off enjoying yourself- and why shouldn’t you? 🙂 🙂 Glad things are settling. You’ll always have writing, Madhu. It’s a part of you. Great pics and a lovely read. Thanks! I felt like I was right there walking with you Madhu, beautiful grounds. It feels like there is a suspension of time within the gardens, and the shock of returning to the sounds and smells of everyday Delhi is very real 🙂 Wishing you a fabulous Sunday Sylvia! Appreciate the tour through your images. I enjoyed the wander, Madhu. What a large, lovely, and varied place! It must provide quite a respite. It is indeed a beautiful oasis Janet. Must be fabulous during the winter months. nicely captured and I agree with you that we envy Delhi for the greenery. And all that palpable history 🙂 Thanks Anindya. That was a wonderful tour. I hope the Indian government always cares for these treasures and doesn’t let them fall into disrepair. Thank you Ian. Hope so too. This looked particularly well cared for. Fresh greenness in the midst of cacophony and chaos is all the more pleasant, isn’t it? What a treasure! Delhi-ites should really take care of this green oasis — such a beautiful and peaceful place in a very big city like Delhi. I’ve heard of the Lodhi dynasty before, but I wasn’t aware of its Afghan origin. A few weeks ago I was actually wondering about how much influence the ancient Afghan dynasties had left in the Indian subcontinent history. Thanks for this informative post, Madhu, and your photos are fabulous! How incredibly peaceful and beautiful. Even at a park, I would have expected to see crowds of people. This seems like a secluded oasis. What a beautiful place Madhu. I don’t know how we missed it when we were in Delhi. We loved Delhi by the way, for all its smog and craziness. I have visited Delhi umpteen times and never been here 😦 Hangs head in shame its not like I didn’t know about it, but I have never ‘experienced’ delhi and its monuments. Refreshing leisurely walk through pages of history ,in commune with nature. So well captured, Madhu. Oh, those arches! So many of them and so different. Somehow I think my favourite building is that last mysterious one. Thanks for a look at some of the beauties of your country. 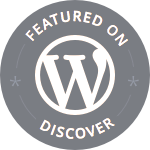 Good to see you on the WordPress. All the best. The images are so well defined, great shots. And I loved the concept of just strolling through. 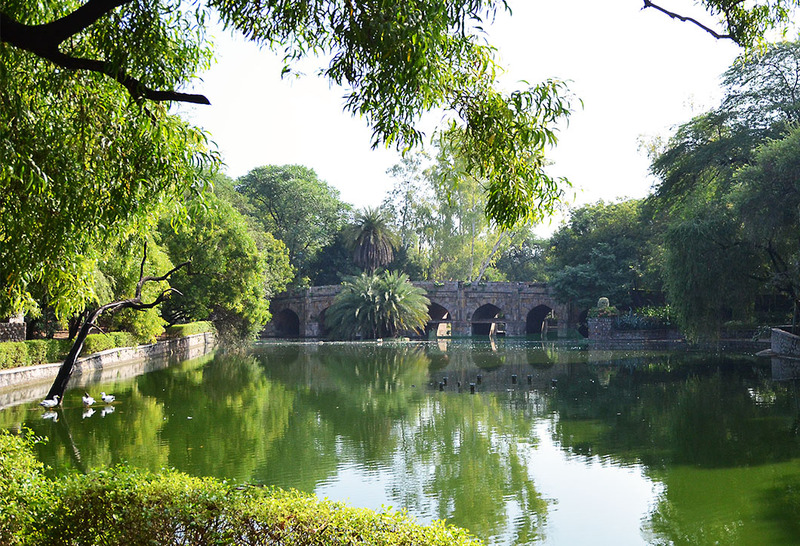 My guess about the Mughal bridge is that they built it for their man-made pond or lake or whatever…they were known for their water stuff in their gardens, eh? 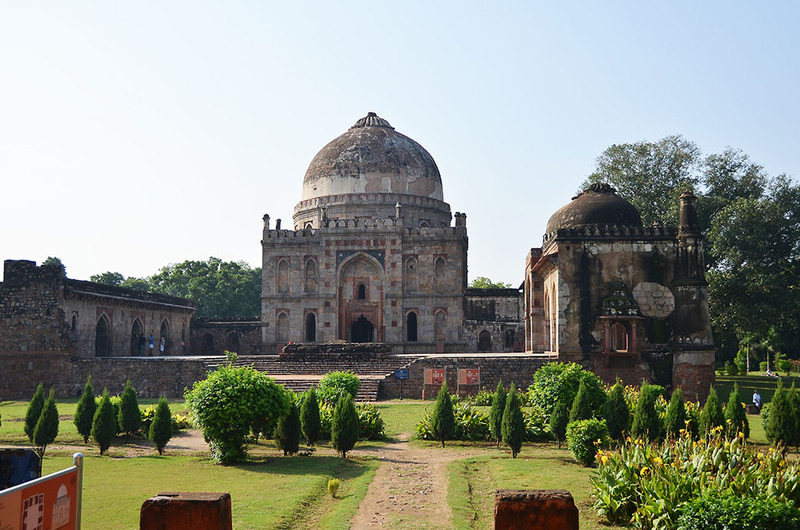 I had made many trips to Delhi in 2010 & 2011 but never made a trip to Lodi Gardens 😦 Or maybe because I was mostly based in Gurgaon at that time. Hmm, perhaps this gardens and the stepwell will be my must-see if I go back to Delhi in the future. Does Chennai have such gardens/parks like Lodi?